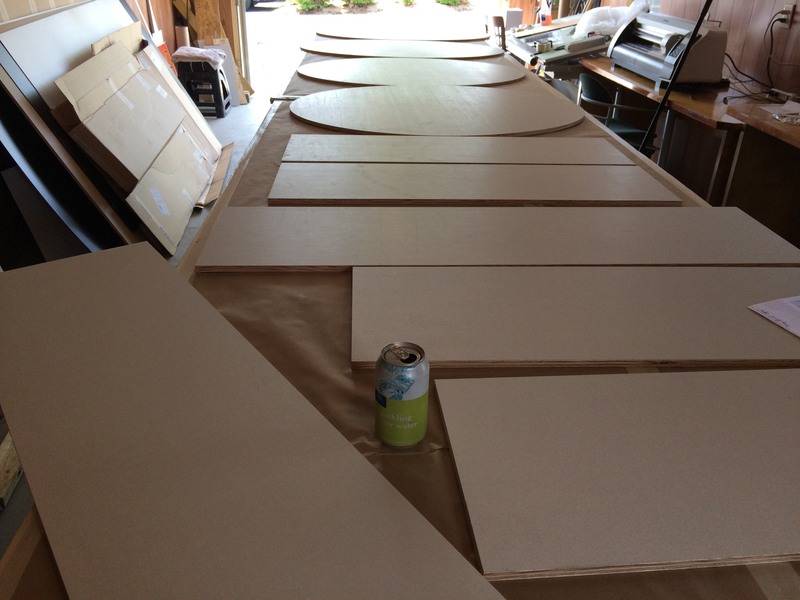 Augusta Sign Company of Waynesboro makes interior sign systems from ordinary to different; simple white on brown rectangular signs to signs of custom shapes and colors. Most of the interior sign systems we make are made in-house from PVC material, usually 2mm or 3mm thick. The signs are typically mounted in wall-installed metal frames or hung from simple scroll brackets for an interesting look. 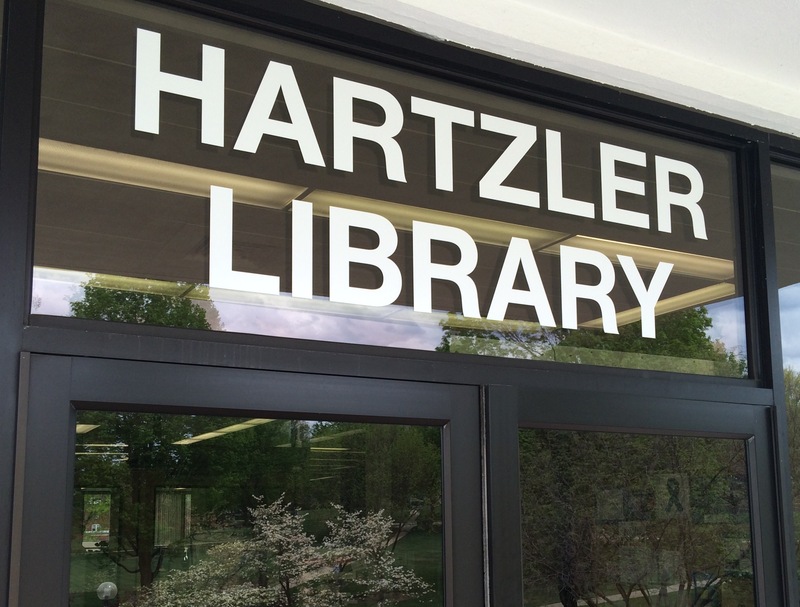 The lettering is typically flush vinyl; cut or printed. Here are a few recent examples of interior signage projects I have done around Waynesboro and Augusta County. The first project for the Blue Ridge Area Food Bank in Verona, VA falls into the “ordinary” group. Not wanting their signs to be too gaudy, the director there chose a simple two-color monolithic design, white letters on brown. 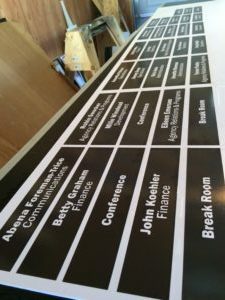 The system consisted of entrance way and hallway directional signs and office door signs intended to help new volunteers find their way around a little easier. Investing in better signage is a good way to spend extra year-end capital, and that was one of the reasons for the idea. Also, the Food Bank recently completed a large building renovation project and it was good timing to add new signage. 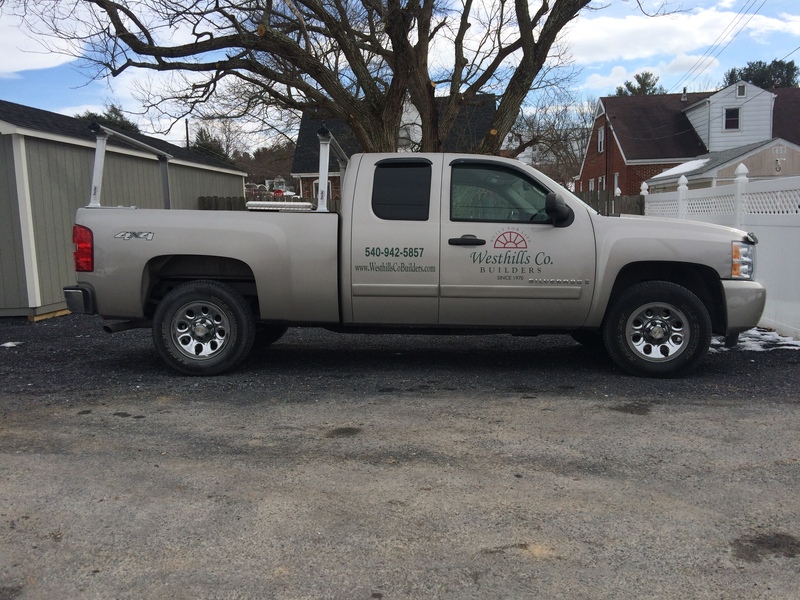 The previous year I had built several new exterior signs for Westminster Presbyterian Church in Waynesboro, VA. 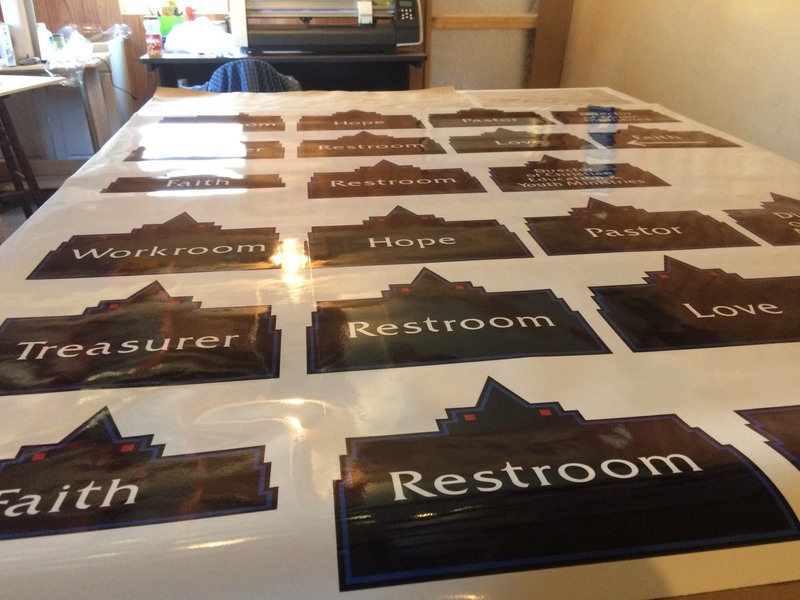 Continuing our relationship, the pastor called on me again for ideas on improving their interior signs at the church office. She had seen some neat signs on Pinterest and she shared the link with me as a good starting point. I chose to use 1/4″ thick white PVC with digitally printed graphics as the sign material and after discussions with the customer, decided to cut them in the same shape as their exterior signs to keep things consistent. The end product was really different. The hangers were plant hanging brackets I picked up at Lowes. 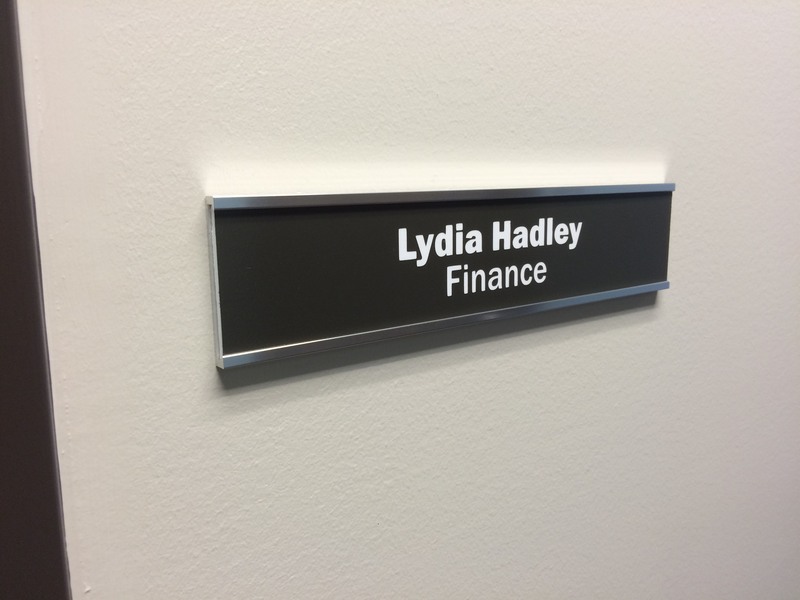 All the office name signs were double-sided and were centered over the office doors; the directory was single-sided and inset into the existing reception counter, in view immediately as visitors enter the office. If you’re in the market for interior signs, contact me anytime. Both of these multi-sign systems (30 plus signs for the food bank’s system and at least a dozen for the church’s) were designed, manufactured, and installed at a cost of less than $2,000. Considering the number of sign s, interior signs are a cost effective way to spruce up your internal image for both staff and guests! A Peach of a Sign System! 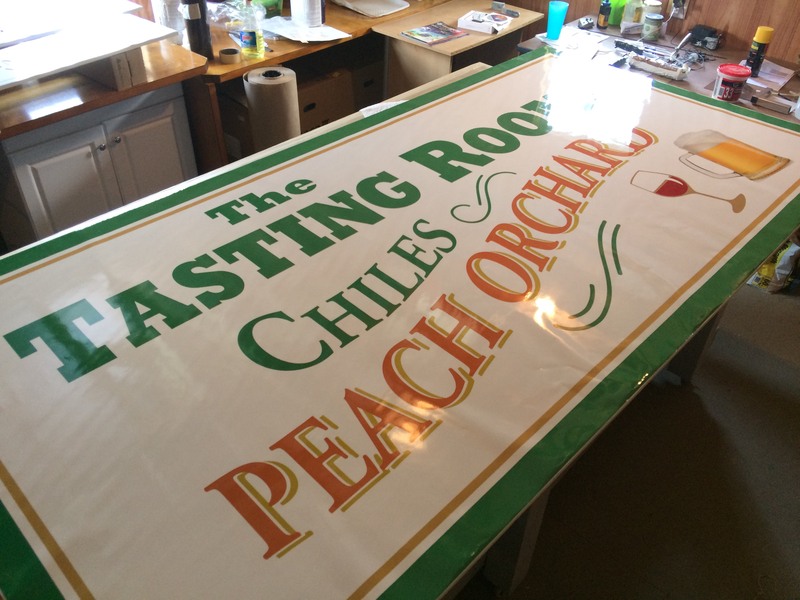 Augusta Sign Company of Waynesboro was approached by the owner of a long-established peach orchard in the Charlottesville, VA area to update a store sign; also provide new signage for their newly added cidery and wine tenants. The first step was to provide a cost estimate to remove and replace the two-sided exterior plywood oval store identification signs with their updated branding, add tenant panels for two upcoming tenants, and add new signage at the new tasting room building. Once approved, patterns were made so the new signs could be mounted on existing iron framework. Signs were constructed in the shop and new wall scroll brackets were ordered to hang signs over the entrances to the two tenant stores. On installation day, the old signs were removed and replaced at the main entrance by the road. Then we hauled a new plywood sign lettered with high-performance 3M digitally printed graphics up to the roof to install on the gable end of the big new barn with great stores inside. We finished it off by hanging the tenant’s individual branding signs over each entrance door. Fortunately, I only had to make two or three trips to the local hardware store during the day’s installation. The new signs look great and our customer was happy. That’s always good news. 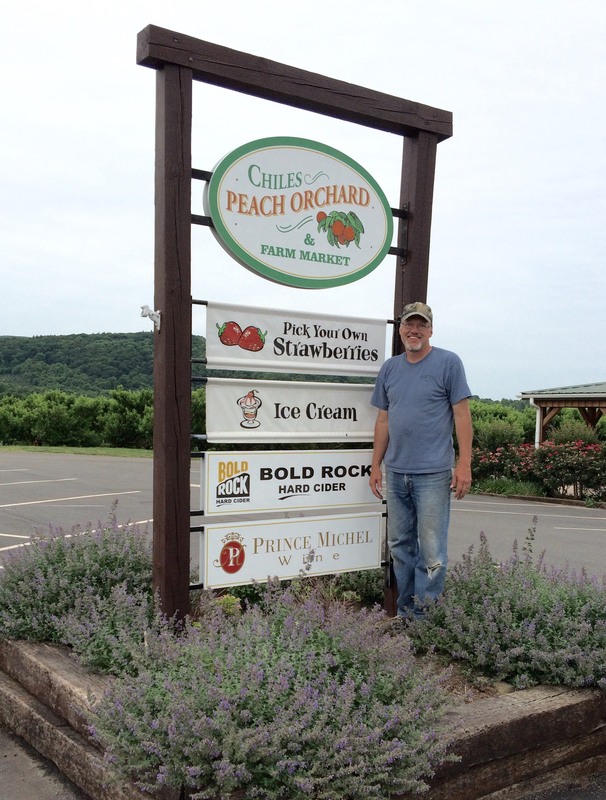 Go out and get some luscious peaches! Visit the Chiles website here. So how in the world did Augusta Sign Company become involved in providing signs for colleges and universities in Virginia? When I began my career in signage, I first worked in the sign shops of good-sized military facilities in Maryland: The National Naval Medical Center, and Andrews Air Force Base. These bases were essentially little cities of their own, and I quickly excelled at keeping the “business” citizens happy with their signs. In this setting the customers were managers of the Commissary, the Officer’s Club, the Rec Center, the Hospital, the University, the Research Center, the Air Terminal, Security, Roads and Grounds, you get the picture…very similar to my customers now in the civilian world. Colleges and Universities are also like mini-communities: having their own internal security operations, buildings and grounds, engineering, marketing, library, rec center, houses of worship, administration, etc. 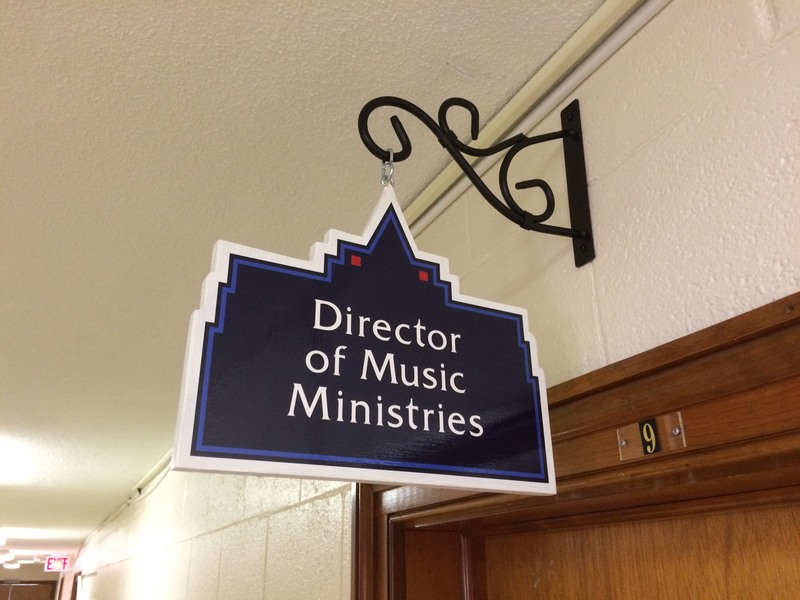 One customer that I have helped since my days at Tree Street Signs is Eastern Mennonite University. This past year I have helped them with many projects: Branding a section of their new Science Center; Fabricating more than 20 light-pole banners as part of an ongoing rebranding; Changing the logos on their wayfinding sign system; Lettering the entrance to their Library. 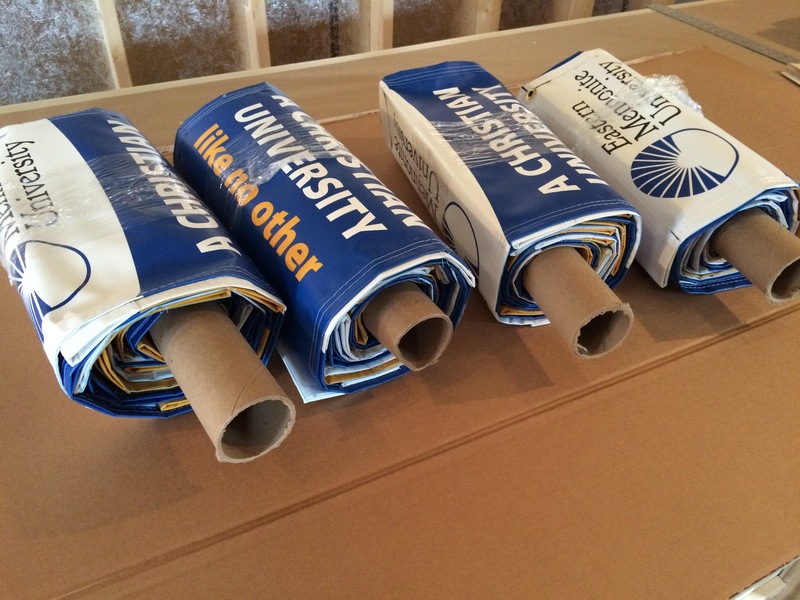 Over my entire career in signs, collegiate and healthcare customers have been my favorites. I typically work with facilities managers or marketing people and there is always lots of work to be done as they strive to keep their campuses looking great and well-branded. I’ve also managed sign projects with Ferrum College and Shenandoah University in Virginia. If you need help with signs for colleges and universities in Virginia, give me a call anytime! Nothing to do with signs, guys, but if people aren’t healthy in Waynesboro and Augusta County, they won’t be able to read signs, so in that respect it may be of interest! The Waynesboro Seventh-day Adventist Church will present a free, informal two-hour vegetarian cooking class Sunday, March 6, 2016 from 3 to 5 PM at 1700 Lyndhurst Rd., Waynesboro, VA.
Presenter, Alina Ehrlich, will explain the nutritional value and health benefits of vegetarian cooking. Attendees will be encouraged to ask questions and taste samples made prior to the event. Recipes will be given to all attendees. Please call 540-949-7291 or 703-915-9115 to RSVP.